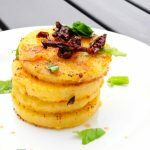 This clean eating Italian Polenta Rounds recipe is great for a simple breakfast any day of the week! So a while back, I was talking to my Facebook followers about how this plant based eating plan is going for me. I mentioned how much better I’m feeling, how I’m losing weight and how my blood sugars are coming back into normal ranges. But another thing I talked about was the fact that I’m keeping a list of foods that DON’T agree with me. I’m keeping my foods very basic so I can tell which foods I react to, and then writing them down so I remember to avoid them if I do react. One of the things I reacted to was corn. Yep, you guessed it, this recipe right here. Not that there’s anything wrong with the recipe, I just found out the hard way my body does not tolerate corn. So this will be the last corn recipe I post for a while. At least it was yummy!! For this recipe, you need to purchase organic polenta in log form. I get mine at trader joe’s in the same aisle as the pasta. It’s totally affordable and one log will give you a full meal or two depending on how many people you are cooking for. It’s good stuff and easy on the wallet. This is a fast and easy breakfast you can prepare in about 20 minutes or an easy side dish to many main courses. Cut the polenta into 1/2 inch thick slices. Warm the oil in the pan and place the sliced polenta rounds in the pan. Sprinkle with garlic and cook evenly on both sides until each side has a bit of crunchiness to it. (about 10 minutes each side). 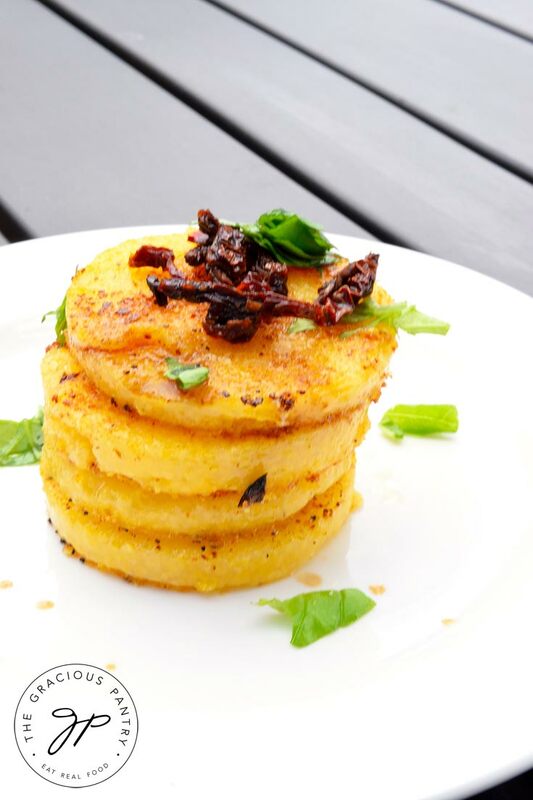 Transfer the rounds to a plate and top with the chopped sun dried tomatoes and fresh basil. Season with salt if desired and serve.